Unfortunately, today I had no energy to trace another size of the same pattern. 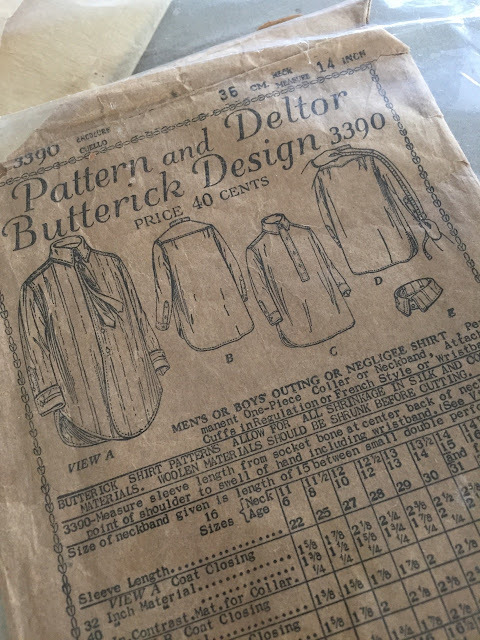 So I came up with an alternative: I decided to make a muslin from a nearly identical pattern, this one an authentic 1920's Butterick men's shirt pattern (above). I've had this pattern in my stash for a few years now, and in my exact size (36). There are a few differences between the Butterick and the Japanese reinterpretation -- the Japanese shirt has pockets, the Butterick does not -- but not many. 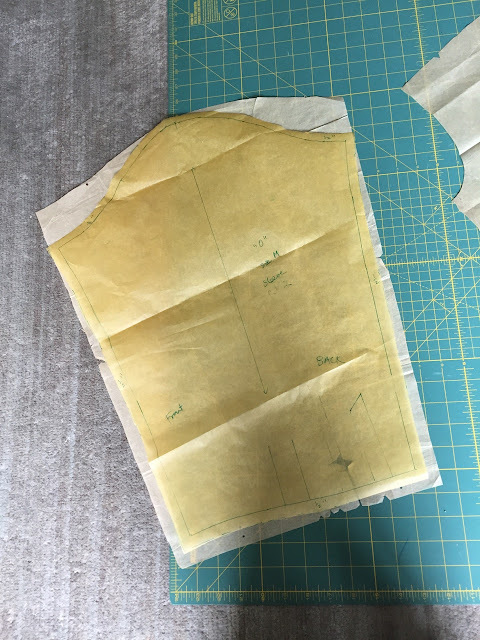 On the Butterick pattern, the armhole is cut higher but the top of the sleeve cap is flatter. This allows me to raise my arm above 90 degrees without pulling up the rest of the shirt with it. It also makes for a slightly fuller sleeve. 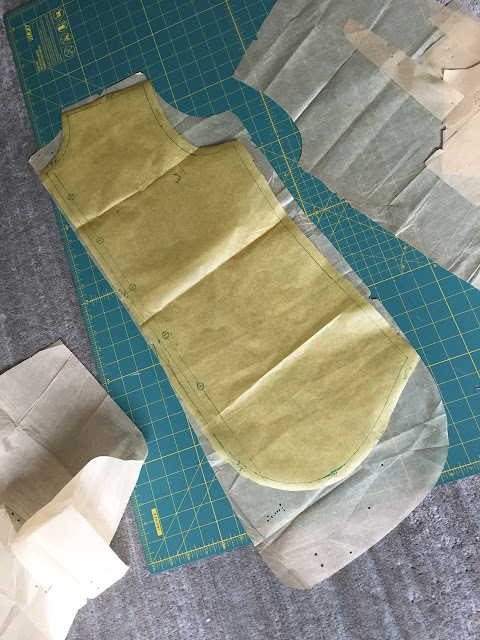 You can see the difference below (the yellow paper is the traced Japanese pattern, below it, the Butterick). 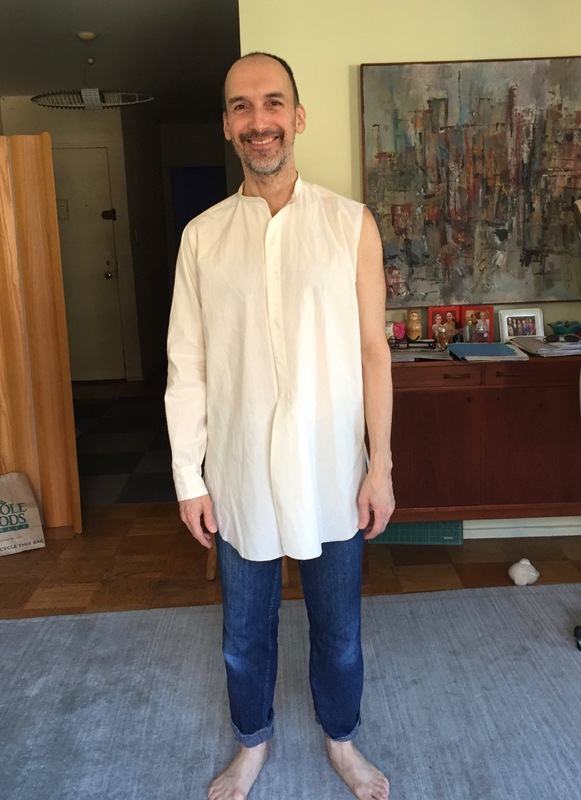 Here's the muslin from the front; I stitched up only the right sleeve. The Butterick is significantly longer than the Japanese version would have been, but I like that. In the end, while the fit is okay, I'm not over the moon about the style. The truth is that I don't really wear band-collar shirts very often. Maybe in a more interesting fabric this would be more exciting. So I think for the moment I'm shelving this project and moving on to something else. I might revisit it in the future, or try a different style from my Japanese pattern book when I'm in the mood to trace again. All in all, I'm glad I made a muslin -- saves time and good fabric! I like it, but if ya don’t feel jazzed about it, then maybe best to revisit another time. 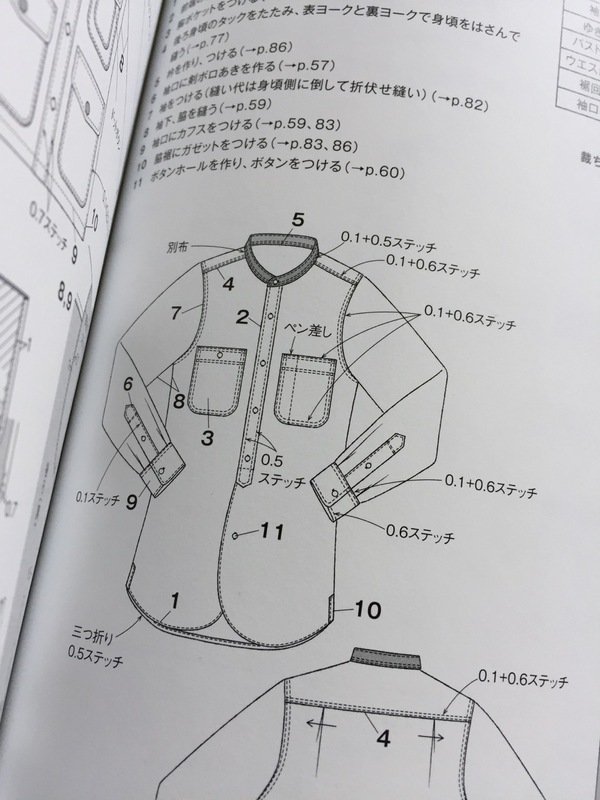 I do like the higher armhole. 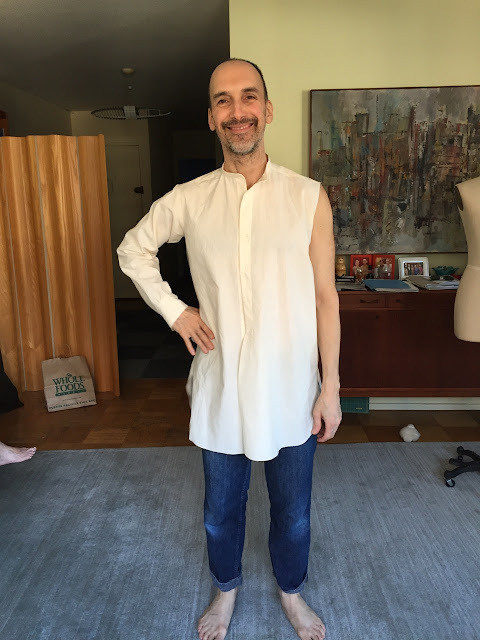 A lot of my RTW blouse armholes are practically at my waist. 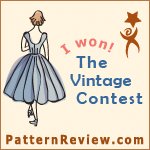 It is a gorgeous shirt, and I hope you find the perfect print or pattern. You could channel your perfect om-chanting 70's guy. Or add a collar and be more conservative. I'm suffering form shirt envy. this is just me, but i find the thought of recreating 1920s styles incredibly compelling. It is too big, both length and fullness. It would be entertaining to see how these compare with your usual patterns. And I agree with the idea of making a muslin, not just to conserve good fabric, but saving your talents and time for a better outcome. Is it weird to say that I love the sleeve shape comparison? Okay, I don't care. I do. Indeed, you are swimming in that tunic. Inspiration is necessary to find joy. When you show us how one can say to one's self, "No. ", or "Not now. ", there is liberation in the lesson. 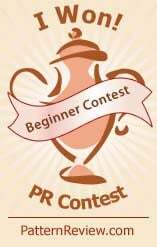 No need to schlep a treadle to a Tibetan peak, for you are the sagacious sewer we seek (not our Yogi, but our Sew-gi). So, fling a collar onto the band! It's only a rectangle, after all. And find a fabric you love to make it up -- this style is very versatile, you'll wear it to pieces. If you still don't much care for the shirt when you finish, hand it over to your Dear Mother as a nightgown. Question: Have you -- or anyone else here -- used safety pins to hold a muslin together rather than stitches/thread to see how it looks/fits? I think safety pins could easily shift; I recommend straight pins along the stitching line instead, but be careful trying it on! What about putting the other sleeve and wearing it as a "negligee" as the pattern suggests? I like it. Has that relaxed pirate shirt or poet shirt vibe. Different from your usual trim, tailored look. Not too much volume, too much length for tucking in, but! not too long if used for lounging about. That white/ivory is good with your coloring. Ah, so do you see in the back shot the tell tale diagonal fold running from the upper sleeve to under the arm? that's what the lower sleeve head does. 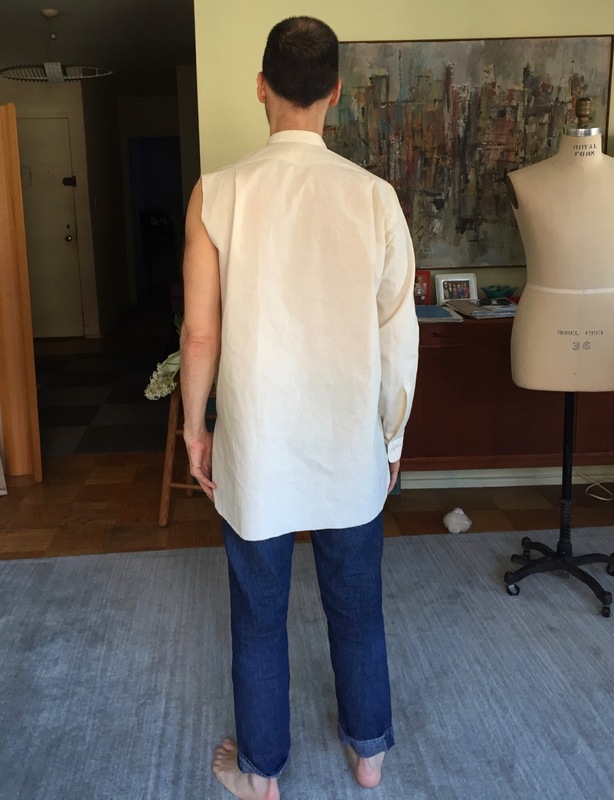 I am making shirts for all kinds of shapes of men and really interested in(and occasionally frustrated by) these fit issues and how to eliminate or mitigate them. That blinking fold is one of the worst! Because as you point out, a high sleeve cap makes the shirt lift a the sides when you are Madonna dancing!! Thank you for putting up that picture of the two sleeve patterns. I am trying to learn about altering patterns but my brain is stunted in 3 dimensionas. Pictures like that really help me.